StickTite Instant stick on reading lenses turn any non-prescription eyewear into bifocal readers, instantly. StickTite Lenses don't need any water to adhere to eyewear: simply peel, stick, and read. StickTite Lenses provide optically correct magnification that are removeable and reusable, and do not leave behind any residue or adhesives. StickTite Lenses are thinner and more flexible than the competition and are available in +1.50, +2.00, +2.50 and +3.00 diopters. Patented technology binds StickTite Lenses on the molecular level to non-prescription eyewear, making them easy to install and long lasting. StickTite lenses are perfect for sunglasses, ski masks, diving gear, safety gear, swimming goggles, safety glasses. StickTite Lenses are proudly made in the USA. INSTANT STICK-ON READERS: Transform any set of non-prescription eyewear into instant bifocals with these stick on lenses that are thin, flexible, and won't come off. 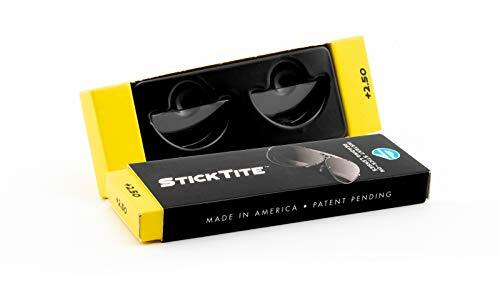 STICK ON READERS FOR SUNGLASSES: Perfect for the beach, the pool, the golf course or any activity outside. There's no need to get a prescription for your sunglasses when you can transform your favorite pair into instant bifocals. MULTIPLE APPLICATIONS: These lenses can turn safety glasses, swimming goggles, scuba goggles, ski goggles and more into instant magnifying lenses perfect for reading when enjoying your favorite activity. PATENTED TECHNOLOGY 10x the adhesive strength of the competition, these stick on reading lenses use advance technology that allow the lenses to stick without the use of water or adhesives and will not leave behind any residue on your eyewear. If you have any questions about this product by STICKTITE LENS, contact us by completing and submitting the form below. If you are looking for a specif part number, please include it with your message.